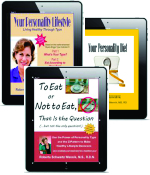 After you’ve read books from Advantage Diets, it would be great if you could share with us how you enjoyed them, what you got out of them, and how they seem to have helped you “live healthy with personality type”. Please include the title of the book you are reviewing. Finally, a book that is tailored to my needs and who I am. 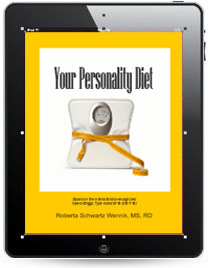 I like the fact that the approach to losing weight suggested in this book takes into consideration my personality type. It’s not a cookie-cutter plan that is the same for everyone. It’s as if Roberta understands me and is working with me as an individual, not as part of a big group. Besides, I found it interesting to learn so much more about myself through type. It’s uncannily accurate. Like most people, I make a lot of decisions during the day. So, this book was really helpful as a decision-making guide. While it’s nice to have choices, at meal-time it can be frustrating. What do I feel like eating? it isn’t just about the flavor I feel like, but how the meal will fit into my daily nutrient allowance. I’m an INTJ, which makes me good at problem-solving. 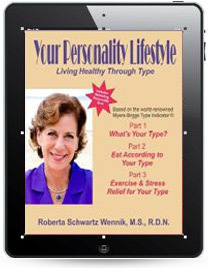 And reading this book showed me how to apply my type-strengths to what I eat and to my lifestyle. For example, I’ve never been too excited about exercising, but I now try to make sure it’s a part of my daily routine. It was just a matter of deciding to do it. I like the fact that I’m in charge. I appreciate that losing weight isn’t just about what I should eat. It’s also making exercise a part of my life, along with learning how to deal with stress. 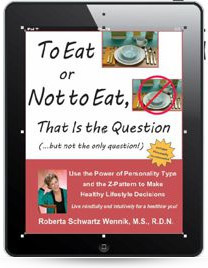 This book covers all topics of living a healthy lifestyle. It’s chocked full of great facts. 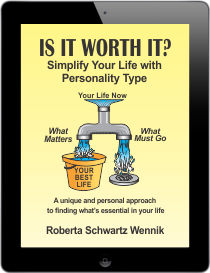 Now that I’ve learned about personality typing through this book and understand other types besides my own, I find I’m dealing with people based more on who they are rather than what I expect from them. I look for signs of what their type is to improve my communication and relationship with them. As a teacher, that’s really important. By following much of what’s in the book, I’m feeling better – more energy and stamina, calmer – and I’ve lost some of the weight. I’m on my way to my goal. As a professional Nutrition and wellness , I was able to significantly improve the care of my patients in a much more precise indivualisation my support , respect of others and harmonization of each personality. I can only highly recommend the whole works for all people concerned to take charge or be using a competent professional.